1. THE NIGERIA ARMY 2. 3. WHAT THEY ARE CURRENTLY DOING TO BIAFRANS? 4. THE POSIBLE WAY OUT. Kindly ride with us on our boat! The Nigeria army, base on their modus operandi could be regarded as the worst terrorist organization in the world. This is due to the fact that they have sent many innocent people including adults and children to their early graves. Simply put: there is no difference between what they do and that of terrorists. They are more deadly than ISIS militants in Iraq, more dangerous than Boko Haram militants and very poisonous than the venom of a cobra. The fight against Boko haram militants is still on but we can assure you that now , Biafra is still being rounded together with Nigeria, 98% of death rates which occurred within the territory is masterminded and carried out by the Nigerian soldiers and the Police. Not less than 700 Biafrans alone have died innocently this year at the hands of the Nigerian military and Police in Abia, Anambra ,Delta Enugu, Delta and Ebonyi States respectively. They have killed more people from 2016 to 2017 compared to what boko haram terrorists have killed. This is the reason why we said that they should be termed militants not government soldiers. The obvious question bogging our minds is this: why have the world leaders remained silent watching innocent people die like fowls in Nigeria in the hands of the Nigerian military and police? Hmmm, terrorists can never be securities to the people no matter what it takes! 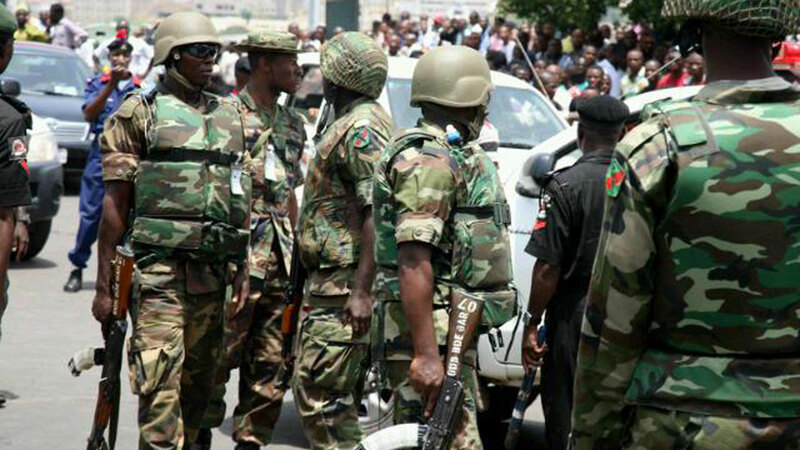 Many Nigerian soldiers from the North are seriously being deployed to the Eastern Igbo Biafran region, heavily armed and some people have not yet understood the reason why they are being deployed to the region. Their mission is simply to slaughter Biafans. This is a fact we have to look into. REASONS WHY SOLDIERS ARE SERIOUSLY BEING DEPLOYED INTO BIAFRA LAND IN BATTALIONS HEAVILY ARMED. APC government under President Muhammadu Buhari leadership and the Hausa nationalities are really proving it right that the Igbos are not Nigerians but some people do not understand this. We all knew that on the 6th day of June 2017, the Hausas issued a quit notice ultimatum to the Igbos to vacate the Northern States before October 1st, and threatened to kill every Igbo who failed to adhere to their ultimatum. In a bid to know the residential houses occupied by the Igbos in the North, governor El-rufai of Kaduna State , where the quit notice ultimatum was made public had earlier in July conducted the registration of the habitants of the State both the indigenes and non indigenes so as to help them identify the abodes occupied by the Igbos when the time is due. Then in a bid to at least, protect our people from being slaughtered on daily basis in Nigeria, Nnamdi Kanu, the leader of the Indigenous People of Biafra inaugurated some group of men and women as Biafra Security Service (BSS). The inauguration of this BSS was the main reason why soldiers with their OPERATION PYTHON DANCE was deployed to Biafra land. 1. THEY BROUGHT A WAR TO US AHEAD OF THE ULTIMATUM ÷ They knew that it is somehow difficult for all the Igbos to vacate the North then eventually, the Hausas must kill them. But if the Hausas start killing the Igbos in the north, definitely the Igbos at home have to retaliate by killing the Hausas who as well might fall victims of the quit notice order. The soldiers were sent to massacre Biafrans should there be reprisal attacks against the Hausas on October 1st and beyond. Do not doubt, be attentive to get the proofs. *. Do you think it is because of the election boycott? Not at all! Have you asked yourself why the soldiers are being deployed to all the South Eastern States? It is simply to wage war against Biafrans when the time comes. Then tell me who will wage war against Biafrans in the north who refused to come back? It is high time we rose up to defend ourselves and our people. **. The operation python dance "11" mission in which the soldiers were being sent is to start on the 15th of September to end on October 14th 2017 according to information made available by the army, while the fast approaching election to be held in Biafra is the governorship election in Anambra State , November 18th 2017 although, which we have vowed to boycott. Their operation is to last one month which fell within the period of the ultimatum. Wao! So all those deaths recorded in Umuahia on November 4th, 11th and 12th as a result of a heavy sporadic and direct shootings by the Nigeria military are just signals that they have arrived in our own land. Hmmm, the child that dances surugede dance never knew that surugede is a dance of the Spirit, when the time comes, Nigeria and their military and all who support their terrorist acts will follow them dance the dance operation python dance which they introduced. 2. THEY WANT TO FIGHT US RIGHT IN OUR OWN LAND ÷ After seeing how Biafrans had almost taken over Lagos State during the Nigeria-Biafra Civil War in 1967 to 1970, they cannot withstand the power of Biafrans this time should war breaks out and that is a simple reason why they sent out soldiers to occupy our territory so as to prevent us taking the war to them. It's high time we wisen up because the terrorists, our enemies are right at our door steps. 3. TO TEST AND KNOW THE METHODS OF OPERANDI OF OUR PEOPLE AND SECURITIES ÷ This simply means how they will get knowledge on how to fight us, when to fight us and what to fight us with. Above all, they would have tagged IPOB a terrorist group of people had it been we retaliated when they started killing Biafrans at Umuahia on the 4th, 11th and 12th days of September 2017. Many people saw the video clip of that incidence, how the Nigerian soldiers arrested unarmed innocent Biafrans, tortured them, dragged them into muddy stagnant water and shot them dead. When you look at all these maltreatments meted on the Igbos by the Hausas, it points to the fact that the Igbos have nothing in common with the North, not to talk more of being Nigerians. The Hausas in the north have killed many Igbos in the past, among who is Magareth who was murdered in 2016 in Kano State for an alleged blasphemy. The Nigerian government and their soldiers did not do anything about that up until now. The Hausas sang a war and hate speech song, nothing was done about that by the Nigerian military rather, soldiers were deployed into Biafra land to assist the Hausas fulfill their mission to massacre the Igbos. THE WAY OUT: Our governors have to rise up and defend their land and as well, protect the masses as promised when they were sworn into power. This is not the time to sit on the fence because if war eventually rises now between Biafrans and the Arewas, indeed, the governors as Igbo Biafrans would be among the finest sheep to be slaughtered by the Hausas.